Cherubim, an order or choir of angels, are usually portrayed as chubby babies with wings. In the angel hierarchy cherubim are considered to be in the second highest order of the nine orders of angels. The Cherubim were sent to Earth to protect the pathway to the Tree of Life. 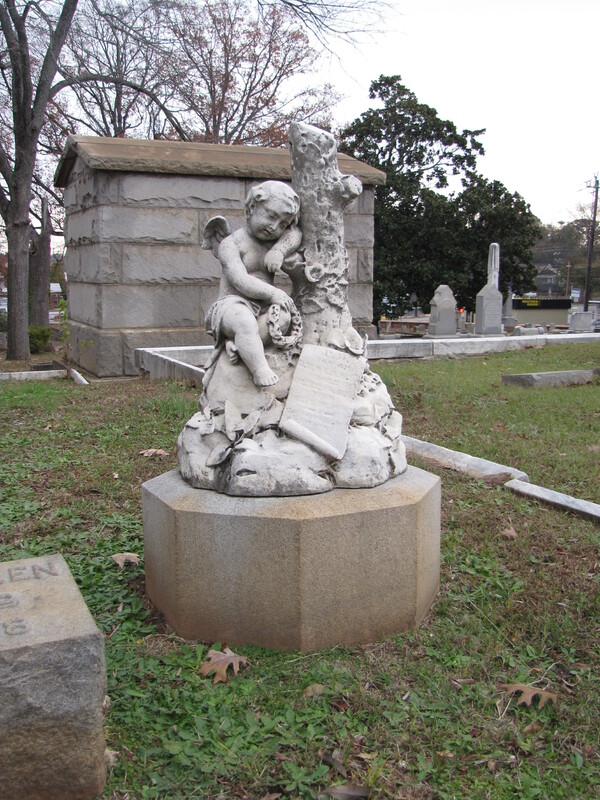 Cherubim sculptures often adorn the graves of children. Here, the cherub is leaning against a tree and holding a wreath. The tree represents a life that has been cut short. The scroll which contained the inscription is almost completely illegible. The word “son” is visible, so we know this is the grave of a child, we just don’t know how old he lived to be.